This resource contains a sample of the curriculum, A to Z Toddler and Preschool Curriculum. It includes A through D, which includes lesson plans, printable lesson plan sheet, and blank letters to decorate. The complete curriculum would be perfect for Daycare centers, Homeschool or church Mother's Morning Out Programs or Preschool Programs. In fact, it's what I use everytime I'm asked to substitute for my church's Mother's Morning Out program and the kids LOVE it!! The complete curriculum is the culmination of many ideas learned over the course of 18 plus years of teaching. The first part of this book contains Classroom Management ideas, How to Set up Your Classroom, Bulletin Board ideas, Daily Schedule Samples and more. This is the only resource a new teacher would need to hit the ground running. It would be ideal for someone who works in a Day Care Center or has one in their home. The remainder of this resource includes Weekly Lesson Plans, Lesson Notes, and Black Line Masters. Each week includes Bible Time, Greeting Circle, Center Time, Circle Time, Story Time, Nap Time, Game Time and Music, and Closing Circle. No additional planning will be necessary to implement the lessons contained in this book. It is set up to cover one letter per week. In addition to the letter of the week, it includes a weekly theme that starts with the letter of the week. The same color, shape, and number are worked on all month long. 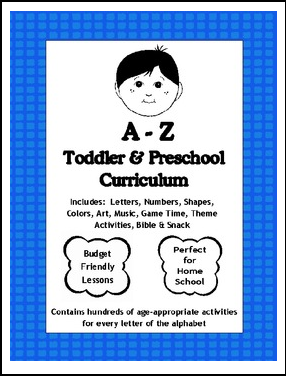 Each lesson includes activities for teaching and practicing letter skills, number skills, shapes, and colors. In addition, there is a weekly scripture memory verse (KJV), art projects, and snack ideas. This curriculum begins in August and ends in May. The activity and craft ideas included are very budget friendly. There are Holiday Lessons plans for every major holiday that falls within the school year.